Aspen’s EM-Series (Equipment Series) trailers are equipment/machinery hauling trailers which primarily serve the construction industry. Configurations vary from payloads of 35 tons through 55 ton capacities, with axle configurations ranging from 6 through 8 axles (including truck axles). Aspen EM-Series trailers feature mechanical removable (machinery) or hydraulic removable neck (contractor) configurations with double drop, square tails. EM-Series trailers can be configured with a variety of components including various deck widths, lengths, styles (flush, flush extendable), pin-on modules, and custom options like mini decks are easily integrated. The EM-Series trailers have common air/regulated air suspensions and can be integrated with a booster when required. Aspen’s EM-Series of trailers are available in specific regional configurations to maximize trailer configurations for specific regional regulations. Experienced Design … Aspen’s EM-Series is meticulously designed by Aspen engineers with over 240 years of combined trailer engineering knowledge. Not only is engineering knowledge important, but the combination of specific trailer industry experience and mechanical engineering knowledge makes our product one of the best trailer brands in the industry. 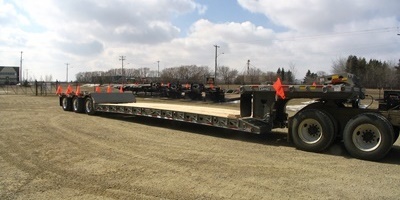 Proven Performers … Aspen has been designing and building trailers for over 38 years and with more than 11,000 custom trailers to our credit, Aspen has the experience and proven ability to ensure your job’s done right—the first time. Aspen’s Machinery and Contractor transporters are all built using fully fabricated four rail mainframes using T1 (100 KSI) steel for added strength and durability. 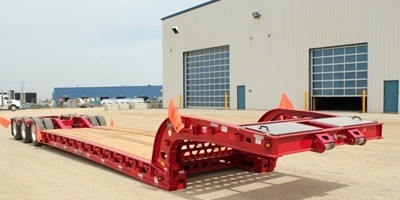 This heavy design, yet low tare weight, allows our trailers to have some of the best payload to tare weight ration which means our trailers are equipped for more flexibility while providing long life and lower maintenance costs. Aspen thinks about flexibility and modularity in its designs and we’ve integrated our designs so that decks from our mechanical gooseneck trailers will fit on our hydraulic necks … and vice versa allowing additional flexibility within your fleet. 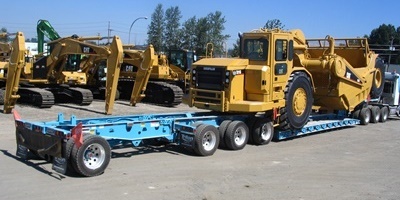 Should you ever want to upgrade your mechanical neck to a hydraulic neck, the it possible to just buy the neck and use it on your existing trailer. Aspen’s feature rich trailers include a gooseneck that allows either a tandem tractor or with a short flip over extension has tridem friendly king pin settings. Along with our goosenecks, we have rear frames that are beefy enough to accept a booster which means your Aspen trailer offers the ultimate in flexibility, allowing you to run in many North American jurisdictions.